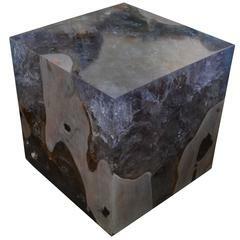 The St. Barts side table is a unique variation of the teak and cracked resin cube. Ice blue or aqua resin is first cracked and added into the natural grooves of the bleached teak wood, sanded and finished with a high polish. Handmade from reclaimed teak infused with blue resin, which resembles a unique quartz crystal with many different facets, as shown here with gold, warm tones created naturally from the wood. A perfect combination of modern and organic. The St. Barts collection features an exciting new line of organic white wash and natural weathered teak furniture. The reclaimed teak is left to bake in the sun and sea salt air for over a year to achieve this unique finish. Select pieces are infused with a brilliant aqua or ice blue resin that is cracked to achieve a unique quartz crystal effect. The final result evokes imagery of the white sand beaches and brilliant aqua waters of the famous French Caribbean Island. 16" square. Andrianna Shamaris. 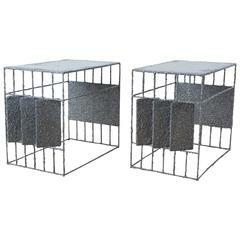 The Leader In Modern Organic Design. 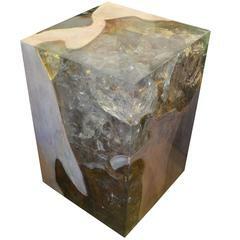 Wood and resin side table with metal base. 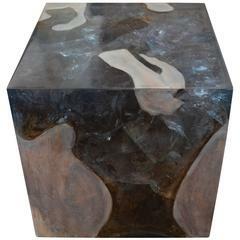 A magnificently handcrafted contemporary resin and wood side table from the outskirts of an island in Indonesia crafted by a local resident. 1950s oriental square bamboo and wood side table.